In 2014, 20th issue of Kodansha’s Evening Magazine is announcing that Yukito Kishiro will release his Gunnm: Kasei Senki or most known by Battle Angel Alita: The Martian War Chronicles manga series in October 28. 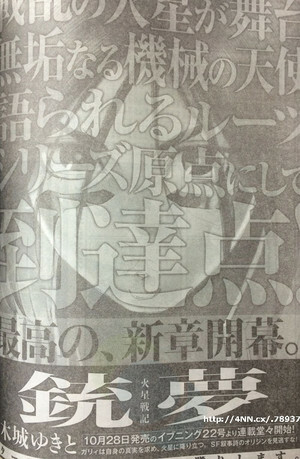 Kishiro had already revealed in January that he would start a new Gunnm manga series in the second half of 2014. He ended his Battle Ange Alita: Last Order manga series on January 28. Kishiro’s original Battle Angel Alita ( GUNNM ) manga ran in Shueisha ‘s Business Jump magazine from 1990 to 1995. A great curiosity about Battle Angel Alita is that Director James Cameron has rights to the film adaptation of Battle Angel. Cameron is said to be a big fan of the manga, and he was waiting until CGI technology was sufficiently advanced to make a live-action 3D film with effects comparable to Avatar. However, he is working on Avatar sequels before starting Alita. On April 18, 2012, Cameron confirmed that Battle Angel is a low priority for him right now, and he doesn’t know when he’ll get to it.